China’s president has issued an uncompromising message on defence and sovereignty that will no doubt be seen as a warning to the country’s neighbours. “We will never be engaged in invasion and expansion, but we have the confidence to defeat all forms of invasion. We will never allow any person, any organisation or any party to separate any part of Chinese land from our territory at any time, in any way,” the president said, without mentioning any country by name. China could not be expected to “swallow the bitter fruit that is harmful to our sovereignty, security or development interests”, he added. The country has adopted an increasingly assertive stance in territorial disputes in the East and South China Seas. Relations with self-ruled Taiwan have also worsened since Tsai Ingwen from the pro-independence Democratic Progressive Party won presidential elections last year. China has not fought a war in decades, but the government argues it needs the ability to defend the world’s second-largest economy. 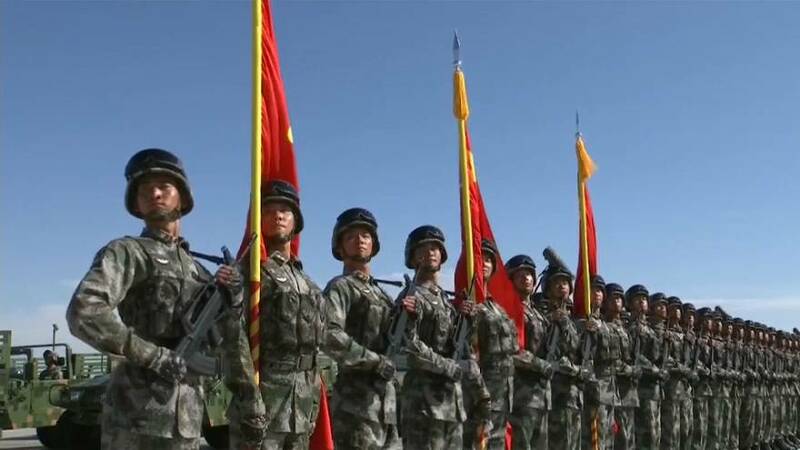 On Sunday the Chinese president inspected troops at a large military parade in the remote northern Inner Mongolia region. China’s armed forces, the world’s largest, are being modernised, although he announced in 2015 that troop numbers would be cut by 300,000. Xi Jinping said the military must unswervingly adhere to the Communist Party’s “absolute leadership”.